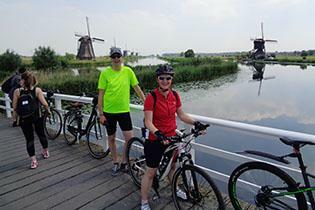 In this bike tour you will experience the beautiful elements in the historic Dutch landscape. 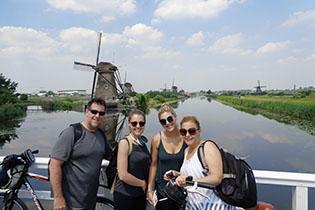 This tour truly has it all: classic polders, windmills, and cheese. From Gouda we cycle through the Krimpenerwaard where time seems to stand still. The land in this area - also known as polders - is about two meters below sea level. It was originally destined for peat extraction, but this plan was abandoned in the 1800s. In Gouderak, we visit a genuine cheese farm (optional activity). 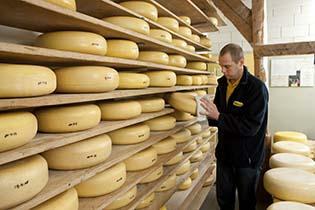 Here you will be invited to taste real Gouda cheese, and the farmer explains how it is produced in the traditional way. In Krimpen aan de Lek we take the ferry to the windmills of Kinderdijk. Since 1997, these windmills are on the UNESCO World Heritage List. 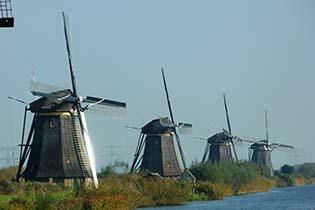 They were built to maintain the polder’s water level. A path leads you past all the windmills, where you can see them up close and take some nice photographs. After lunch we continue our bike tour along the Lekdijk. We cross the Lek by ferry again and continue along the ancient polder roads. After a visit to a Delftware factory (optional activity) we return to Gouda where our tour ends at the Market square. Scheduled tours (€ 45 p.p.) are on Thursdays, Fridays and Saturdays. Please contact the tour operator via the Information & contact button above for the exact dates.